Nasdaq-listed Chinese mobile phone battery maker China BAK Battery Inc will set up a unit at Chennai in Tamil Nadu. BAK Telecom India, the Indian subsidiary of the $300 million company, is in talks with the TN government, while the necessary approvals had already been taken. “Our India plant would be up and running in the next three years,” BAK Telecom marketing head Neeraj Joshi told Business Standard. 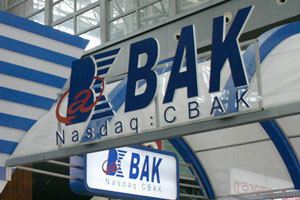 China BAK, which is listed on Nasdaq as CBAK, is the sixth and the second largest battery maker in the world and China respectively. It is the original equipment manufacturer (OEM) supplier to handset makers globally, including Nokia, Samsung and Sony Ericsson. The company has two manufacturing units in Shenzhen and Tianjin provinces of China producing 1.5 million mobile battery units per day. It recently launched its mobile batteries in India under the brand E-BAK and is expanding its distributorship network. The company is focusing on the huge replacement mobile battery segment. “The Indian replacement battery market is worth about Rs 2,000 crore, of which 95 per cent is the grey market. We are targeting both branded and grey segments with our products,” he added. BAK Telecom has penetrated the Delhi, Punjab, Rajasthan, Uttar Pradesh, Haryana, Maharashtra and Gujarat markets so far. “We target a network of 75 distributors in Northern and Western regions in this fiscal. Next year, we will focus on markets in the Eastern and Southern regions,” Joshi informed. In near future, the company plans to diversify into laptop and car batteries as well.